The test uses a cantilever test piece of 10 mm X 10 mm section specimen having standard 45 ° notch 2 mm deep. This is broken by means of a swinging pendulum which is allowed to fall from a certain height to cause an impact load on the specimen. The angle rise of the pendulum after rupture of the specimen or energy to rupture the specimen is indicated on the graduated scale by a pointer. The energy required to rupture a specimen is the function of the angle of rise. 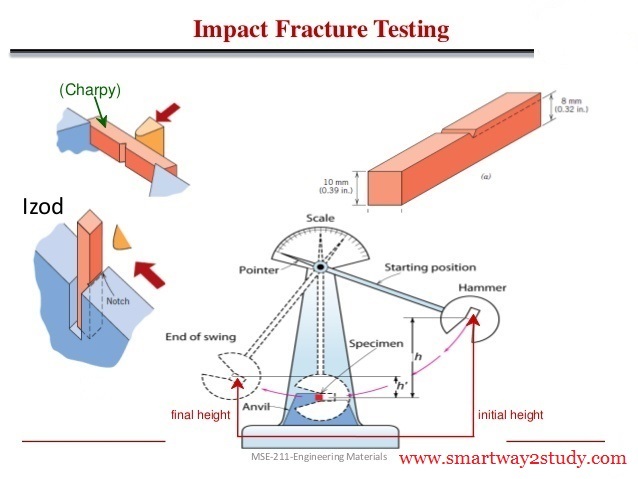 Fig shows pendulum type impact testing machine.